The Popsicle Parade - Part 1! | Dinosaur Dracula! With summer just over a month away, I’m only a little early in launching Dino Drac’s latest recurring feature. Introducing The Popsicle Parade, a multi-part series celebrating dozens of the wonderful things we used to buy from ice cream trucks! There’s a certain “artistry” to popsicles that’s easy to admire. The colors! Those weird shapes! The impressive skill with which random cartoon characters’ heads were somehow forged out of quick-melting water ice! Nearly none of the treats I’ll be featuring are still on the market. They came out at various points in the past 25 years, delighting our eyes and stomachs for a limited time only. Don’t let any of these things make you too specifically hungry, because you just can’t get most of these beauts anymore. 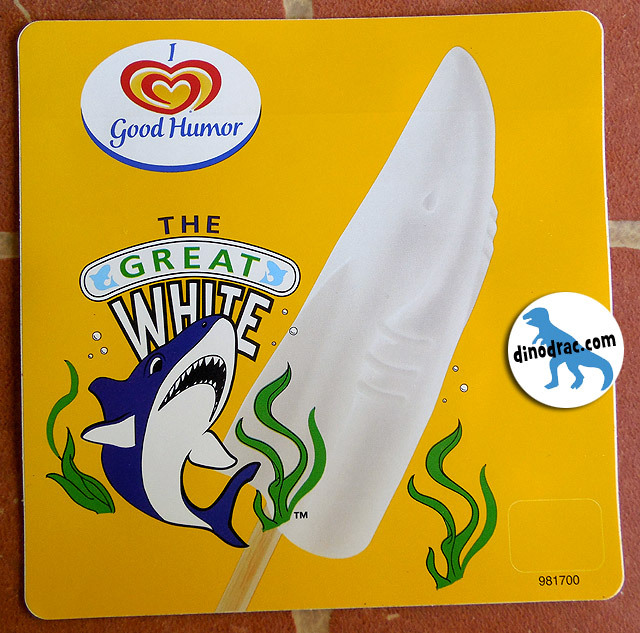 This popsicle takes its likeness from Ripster, the “great white” Street Shark who served as team leader. 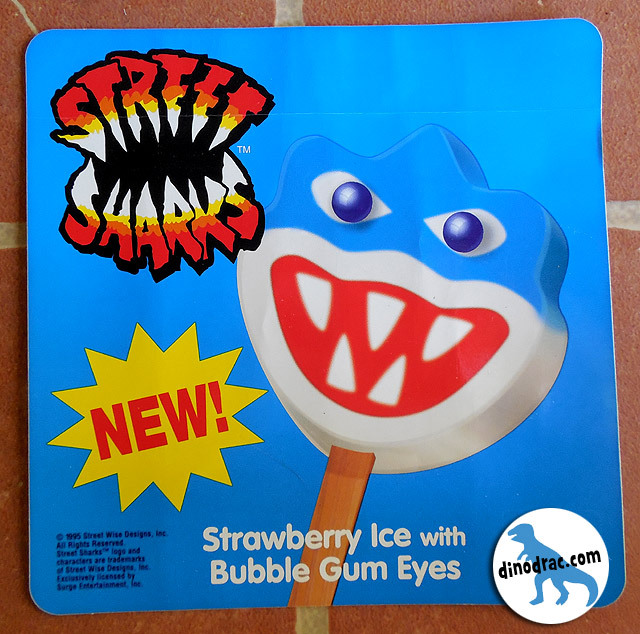 Course, you don’t need to care one bit about the series to appreciate a shark popsicle with tiny bubble gum eyes. 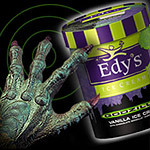 The fact that its flesh was made of somewhat unusual strawberry ice made it all the sweeter. Edible Americana, but with a twist. The last of the three “sections” was stuffed with Pop Rocks, which aside from heightening the flavor, also made the popsicle crackle and pop in our mouths! A brilliant upgrade, no doubt. 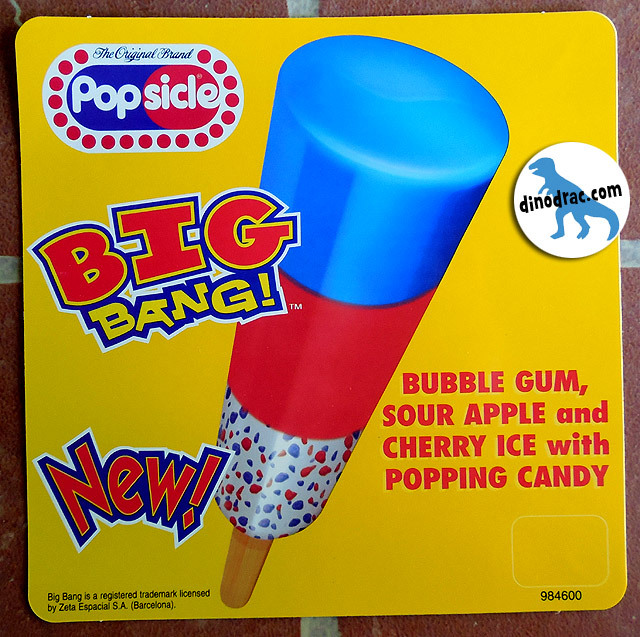 While I wouldn’t have normally chosen an everyday “Bomb Pop” over the slew of icy hero heads waiting in the ice cream truck, that Pop Rocks bonus would’ve changed everything. 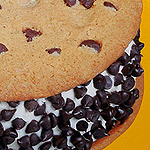 #3: Klondike Double Decker Sandwich! Okay, technically, this isn’t a popsicle. I’ll be breaking that rule fairly often during this series, so get used to it. The beauty of the Double Decker was how it helped us skirt guilt. 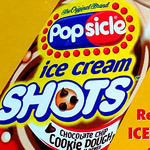 Surely there have been times when no single item from the ice cream truck would’ve been enough to satisfy you. 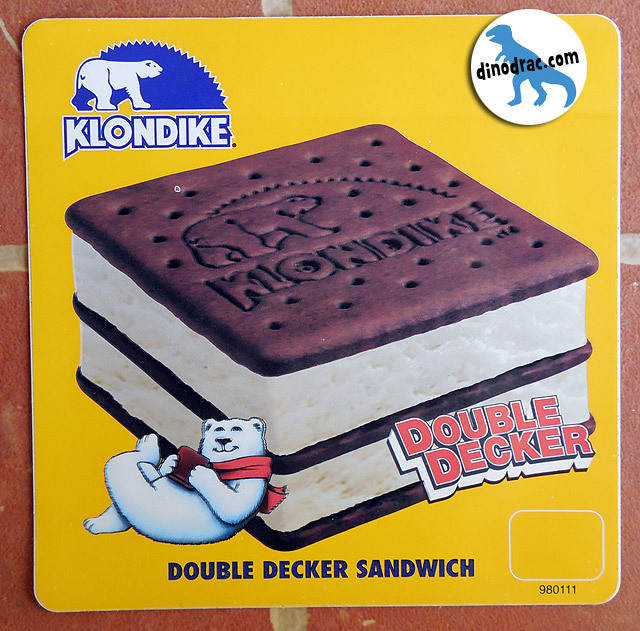 Klondike’s Double Decker was almost as good as buying two treats, while totally removing the fear that the ice cream man might call you a demon. No longer would we pretend to pick up second desserts for imaginary younger sisters. If we wanted to feel sickly full, the Double Decker was our lord and savior. 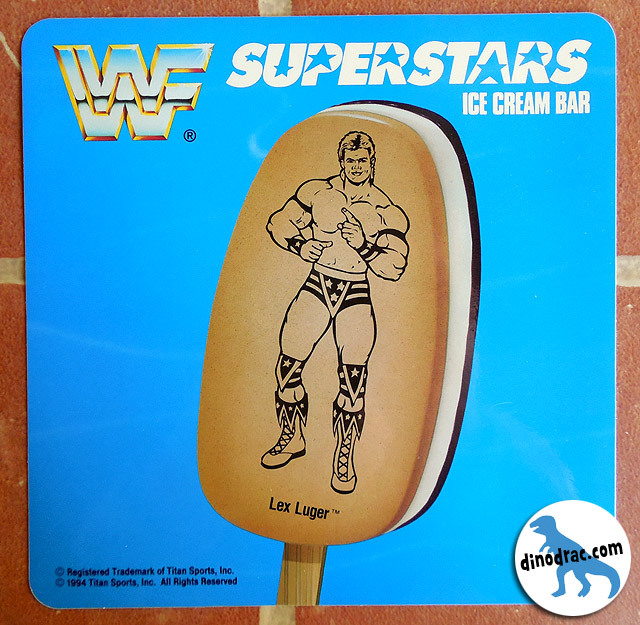 #4: WWF Superstars Ice Cream Bar! 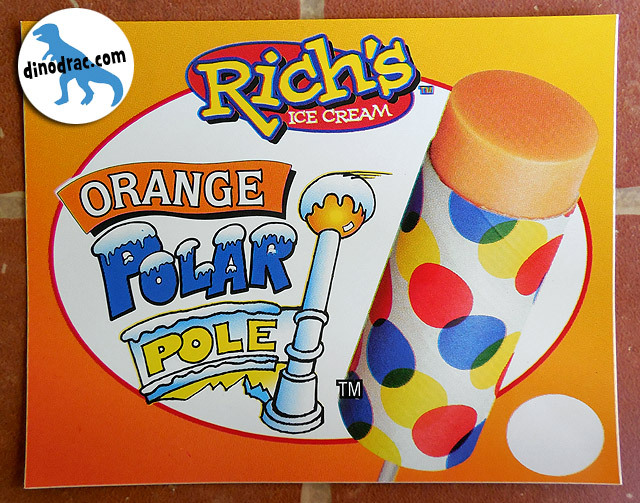 One of the most famous popsicles ever! With a middle of vanilla ice cream and a backplate of hardened milk chocolate, the key component was the mushy cookie front, each stamped with the likeness of a pro-wrestler! These were required eating for wrestling fans, but with the bars being so unique in their presentation, even many non-fans couldn’t resist them. As an added bonus, each came with a free trading card! #5: Super Mario Bros. Bar! 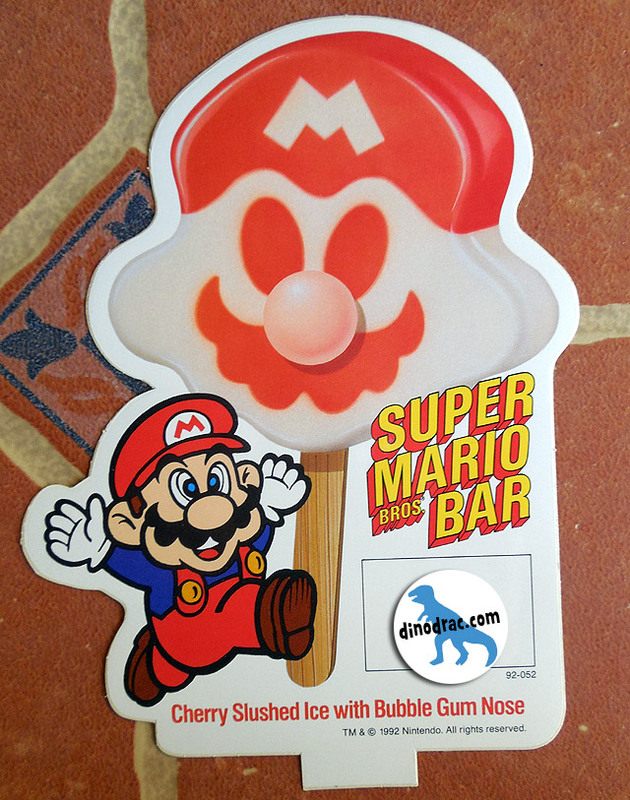 The Super Mario popsicle was available in spurts over the course of many years, and for all I know, it’s still being made today. Nintendo kept things simple, sticking with the flavors and extras that were already proven hits. 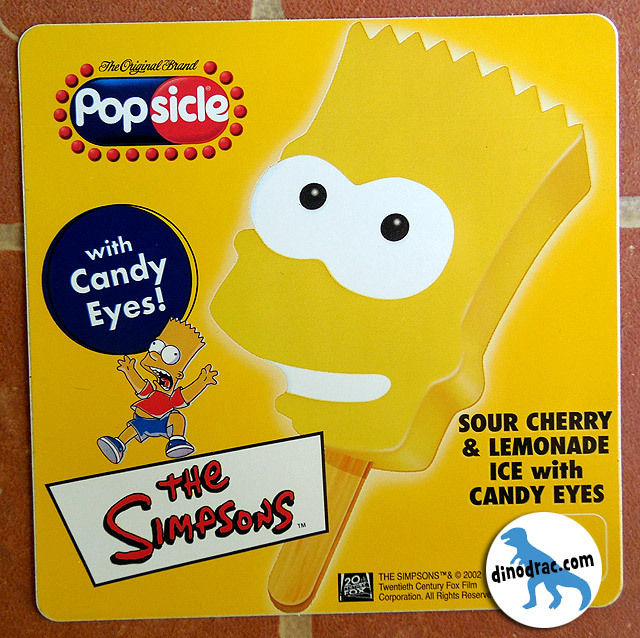 For one thing, the popsicle was made of cherry ice, which is one of those “safe” flavors that everyone loves. 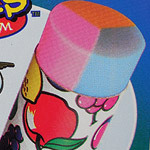 Then, borrowing an idea from several popsicles that preceded it, the vaguely Mario-themed head was topped with a big pink gumball nose. 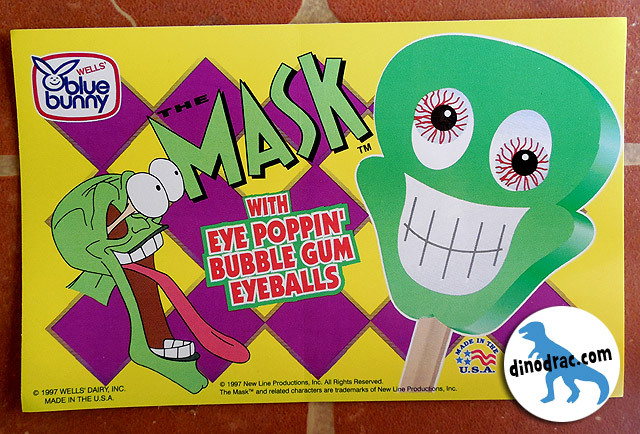 In the realm of popsicles, we must never discount the power of gumball body parts. Through the years, I have suffered through some pretty piss poor popsicles to get at those things. In truth, for many of us, the gum was the whole point. We’d toss the popsicle after two licks just to hurry the process. While I certainly remember these, I can’t recall their flavor. 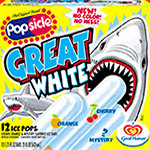 Smart money is on “lemon,” but I can’t rule out the possibility that this was one of those popsicles that hid “cherry” under an unassuming cloak of white. More importantly, IT’S SHAPED LIKE A SHARK. From 1997, these weren’t based on the Jim Carrey movie, but rather the cartoon series that spun from it. Which, to be honest, I have not seen one single episode of. This one was HUGE for me. I don’t remember the flavor, but that was never important. 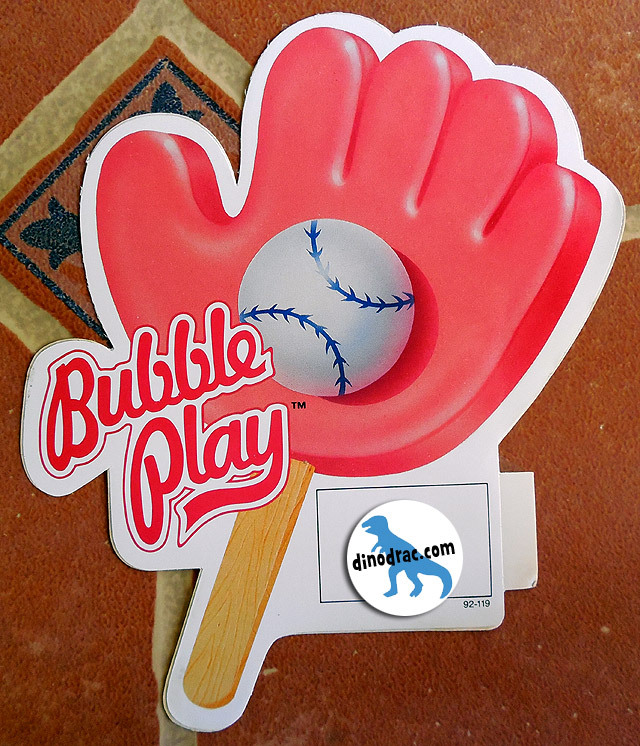 It was all about that baseball gumball. The stitching really sold it! 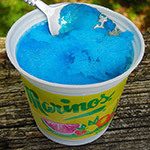 This wasn’t something I ever remember getting from an ice cream truck, but we always had boxes of these in the house. I see this, and I’m instantly four-years-old again. If memory serves, I knew them as “Push Pops,” and I’m fairly certain that the ones I used to eat had some promotional link to Fred Flintstone. The rod of sherbet became progressively messier as you ate your way through. There was no way to look graceful while eating these. If you don’t believe me, try it. Whether by “Rich” or another maker, bars like this are definitely still around. Bart’s flesh might not look delicious, but with sour cherry and lemonade flavors, it most certainly was. Bart adopted the gumball eye strategy as well, even if his were a bit on the small side. As I recall, it was especially fun to eat his hair, as it let you provide Bart with a series of alternative hairdos before finally killing him with the death bite. I hope you like ice cream, because I think I have enough ammo to do at least 5 of these posts. Stay tuned!